Just like with televisions, a good projector these days requires 4K Ultra HD resolution. When choosing a projector, there are a few technical aspects you’ll need to keep in mind, such as throw distance (how far the projector is from the screen) and screen size limitations (you don’t want a projector that isn’t powerful enough to provide a clear image across a large screen). When setting up your home theater, we’ll assess the space and choose the projector with the best specifications for it. The highest quality projector won’t do you much good if you don’t have a good screen to accompany it. You may think all screens are pretty much the same, but the truth is that there are a lot of different types of screens to choose from. For example, if your home theater is in an area with a lot of ambient light, such as an outdoor theater, you can get a screen specifically designed to only accept light from the projector. Another neat style of screen is acoustic transparency—the screen is perforated with tiny holes that don’t affect visual quality, but still let sound pass through so that you can place speakers behind the screen. Two-channel audio won’t cut it for a dedicated home theater. Instead, surround sound is the way to go. Setting up high-quality surround sound can be tricky if you’re not an audio expert. That’s because there are so many things that can affect how sound moves around a room—the placement of speakers and seating, acoustic treatments, room shape and layout, and so on. During a professional home theater installation, each speaker is carefully placed to provide strategic surround sound, and then the entire audio system is optimized to ensure there are no dead spots or overly loud areas. An important characteristic of a professional theater is how easy it is to use. You shouldn’t have to fumble around with your projector, Blu-ray player, screen, and speakers trying to get everything powered on with the correct settings. Instead, we design our home theater systems to perform at the push of a button. It’s possible through smart home automation technology. All of the devices in the theater room, from the projector to the cable box to even the lights, are connected to a central control system. The system is set up with easy access to all of your streaming services, media servers, and more. So when you want to watch a movie, all you have to do is pull up the app on your smartphone and press the “Movie” button. The system will power on and display your different film options, the lights will dim, the thermostat will lower, and before you know it, the entire room will have transformed into the perfect movie-watching environment. Are you looking for an upgrade to your home media experience? 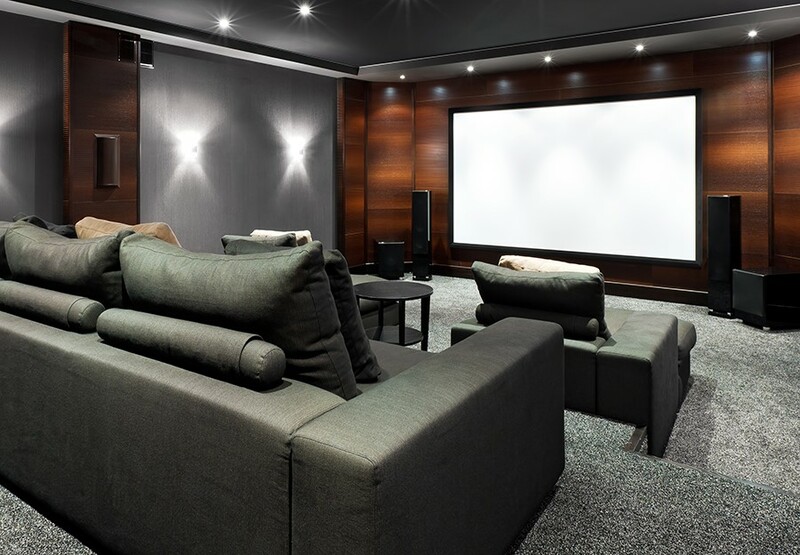 Contact us today to learn about our home theater design and installation services.